Time to sell your condo in Walker Key? Read info on today's resort-market condo buyer. Walker Key condominium is located off of Canal Road in Orange Beach, Alabama, approximately 1.5 miles east of the intersection of Canal Road and Highway 161. Walker Key is a group of properties ranging from a basic condo design to duplex and residential-style properties. 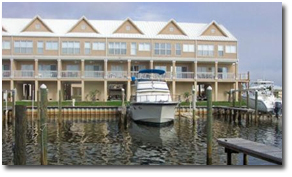 Walker Key has a place for boats, which is valuable for potential buyers who are coming to Orange Beach to take advantage of the fantastic fishing and boating opportunities; view all Orange Beach condos with boat slips. The condos have assigned slips with deep water access. Walker Key is also very close to Sportsman's Marina and is across the street from the Orange Beach Recreation Center. The condos and homes in the Walker Key community are also close to a variety of the best restaurants in Orange Beach and a short five-minute drive to Gulf Shores, Alabama. Please let us know if you would like further info on Walker Key or any other Orange Beach condos, home, or real estate in the area or would like to schedule a private viewing by emailing info@condoinvestment.com or by calling 251-Area-Pro (251-273-2776) for immediate assistance. RENTAL TIPS to increase your Walker Key rental revenue. Find annual rental income for Walker Key and all other Orange Beach & Gulf Shores condos.